April 27th, 1 – 5 pm. Free to the public. Held at Redwood Valley Grange. Taught by Nori Dolan No previous Art Experience Necessary. Register by April 16th to reserve your spot. 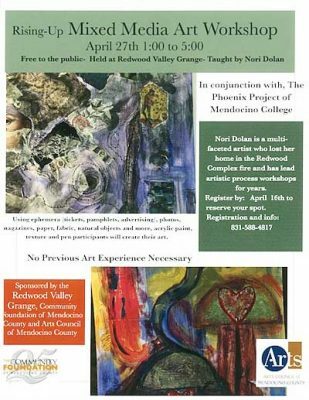 Registration & Info: 831-588-4817 Nori Dolan is a multi-faceted artist who lost her home in the Redwood complex Fire & has lead artistic process workshops for years. Sponsored by the Redwood Valley Grange, Community Foundation of Mendocino County & the Arts Council of Mendocino County. 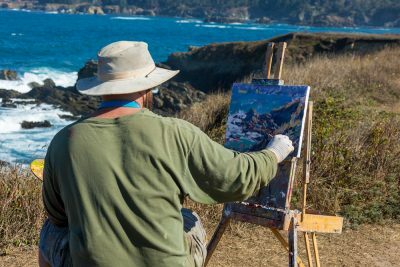 The Mendocino Art Association (MCAA) presents another Plein Air opportunity for artists working in any medium. Clark Mitchell, a perennial favorite instructor, returns to instruct participants in his how-to approach to the challenges of outdoor painting. 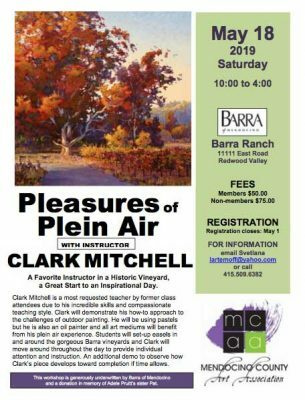 This art experience will be held at the historic Barra ranch, 11111 East Road, Redwood Valley, on May 18th with vast opportunities to find exciting subjects to paint or draw. The fee for MCAA members is $50.00 and non-members $75.00. For more information call Svetlana Artemoff at 415-509-6382. Year after year, Clark Mitchell’s return has been requested by past participants to his workshops. They admire his art, his teaching style and appreciate his attention to each person during class. Clark resides in Sonoma County and paints and teaches in a straw bale studio. He participates in numerous art events and has won many awards including Master Pastelist by the Pastel Society of America and a Distinguished Pastelist by the Pastel Society of the West Coast, He has received numerous awards in local as well as national competitions. For more information about classes in Clark’s studio look to cgmitchell.com. Martha Barra, Barra of Mendocino, has generously provided the site of their historic Redwood Valley ranch for this event. The winery is family owned and has been farming organic grapes since 1955. Participants in this event will choose a painting site from the vast number of farm buildings, heritage vineyards and landscape views. Clark Mitchell will work on a pastel of his own and walk among the participants helping where he is needed. The Mendocino County Art Association is the oldest art organization in the County, established in 1954, its objective is to offer lectures, workshops, classes and art exhibits for the benefit of its members and the public at large. Members workshops at a reduced rate and opportunities to show their art in banks, businesses and galleries. Membership in the association is $35 a year, call 707 972-0784 to join or receive more information on other benefits of membership. SPACE Summer Camps 2019 Register Now! 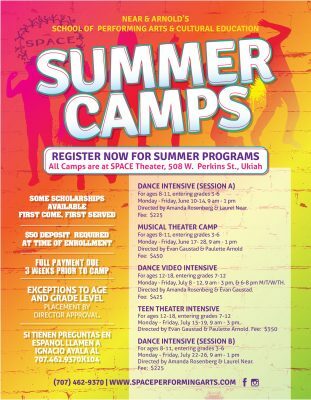 SPACE (Near & Arnold’s School of Performing Arts & Cultural Education) is offering four performing arts camps for ages 8-18 beginning June 10. Dance Intensive, directed by Amanda Rosenberg and Laurel Near for ages 8-11, entering grades 3-6. Street Dance / Fusion Dance classes and performance technique with an informal open showing. Two sessions, one week each. Musical Theater Camp, directed by Evan Gaustad and Paulette Arnold for ages 8 – 11, entering grades 3 – 6. Learn scenes and songs from popular Broadway musicals ending with a performance. Two weeks. Dance Video Intensive, directed by Amanda Rosenberg and Evan Gaustad for ages 12 -18, entering grades 7 – 12. Train in street dance / fusion, perform live and be in a music/dance video. One week. Teen Theater Intensive, directed by Evan Gaustad and Paulette Arnold for ages 12 – 18, entering grades 7 – 12. Rehearse & perform acting, singing and dance. One week. Some scholarships available first come, first served. Info: SPACE at 462-9370 or www.spaceperformingarts.org. Spring is here, dust off the cobwebs, repurpose an old chair, help support local arts. The Chair Affair fundraiser returns to Art Center Ukiah. Artists are asked create and donate an Art Chair to be auctioned in June. Each Art Chair will be entered to win the people’s favorite prize. Contact Art Center Ukiah for entry forms. 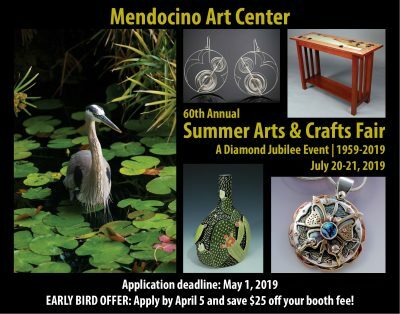 Apply now to be an artist at Mendocino Art Center’s 60th Annual SUMMER ARTS AND CRAFTS FAIR Saturday & Sunday, July 20-21, 10 am – 5 pm Application Deadline: May 1, 2019 Early Bird Discount: Apply by April 5, 2019 and save $25 off your booth fee Download an application at http://www.mendocinoartcenter.org/PDF/summer-fair.pdf The Mendocino Art Center is now accepting applications from artists and craftspeople for the 60th Annual Summer Arts and Crafts Fair. Handmade original artwork in all media is acceptable. Coinciding with the renowned Mendocino Music Festival, the fair draws a large number of visitors from the Bay Area, the Sacramento Valley and southern California, among other regions. In addition to the arts and crafts booths, the fair also features live music and festive food and drinks. Join fellow artists, art lovers, and new and returning customers in the charming town of Mendocino on the beautiful Mendocino Coast. 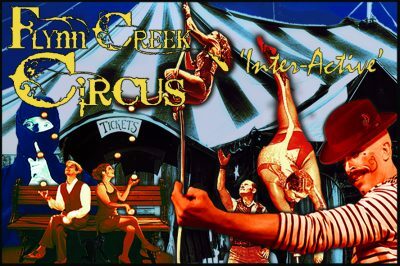 Flynn Creek Circus Camp enrollment now open! Re-opened Disaster Recovery Fund helps restore lost equipment and income. 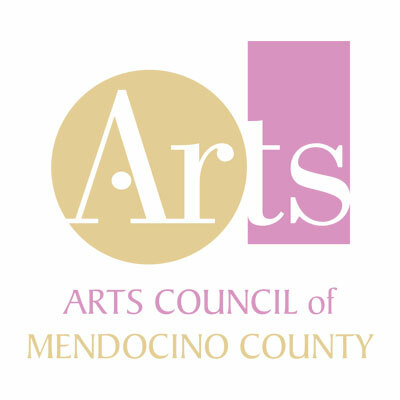 The Arts Council of Mendocino County (ACMC) is committed to long-term disaster recovery through the arts. 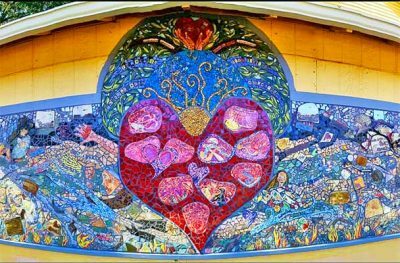 Following the Redwood Complex Fire of 2017, the ACMC sponsored multiple community healing through the arts projects, including Art from the Ashes, the community-built mosaic now installed at the Redwood Valley Grange. 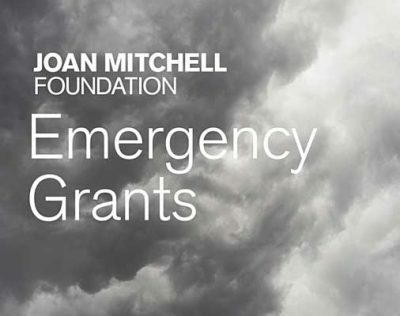 The ACMC issued twenty-nine mini-grants of $200 each to fire survivors in the immediate aftermath of the fire, shared information about business discounts and national grant opportunities, and helped Northern California Grantmakers assess the post-fire impact on the arts communities of Napa, Sonoma, and Mendocino. ACMC Executive Director Alyssum Wier, states, “Following a year of destructive natural disasters in the state of California, the California Arts Council invited counties affected by wildfires or mudslides to apply for a grant to help their local communities recover. The ACMC’s grant application was successful and we are now able to re-open our Disaster Recovery Fund for artists directly affected by the October 2017 Redwood Complex fires in Redwood Valley and Potter Valley.” ACMC’s re-opened Disaster Recovery Fund will help restore physical losses and lost income for Mendocino County artist residents. A total of $30,400 is available and grants are expected to range from $100-$800. Applications are due by April 30, 2019. Application & Guidelines PDF Applicants to the Disaster Recovery Fund must be Mendocino County residents directly affected by the Redwood Complex Fire of October 2017. Determinations regarding grants will be need-based, and not related to judgments on quality of artistic output, although scope of loss and other available resources will be taken into consideration. Non-professional artists may also apply. “Artist” includes full-time, part-time or contract actors, architects, artisans, craft artists, dancers, filmmakers, designers, musicians, photographers, traditional/folk arts practitioners, visual artists and writers. This project is made possible by the California Arts Council and the National Endowment for the Arts. To learn about how state and federal arts grants impact individuals and communities, visit www.arts.ca.gov and www.arts.gov. Applicants may submit a completed form as follows: by email (with subject line “ACMC Disaster Recovery Fund”) to director@artsmendocino.org; or by mail to Disaster Recovery Fund, ACMC, 309 East Perkins Street, Ukiah, CA 95482. 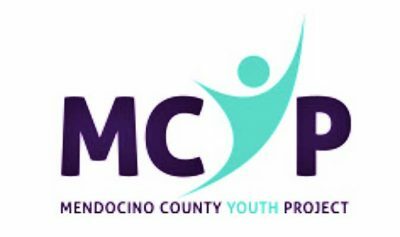 CONTACT INFO: Randi Sanchez, 707-463-4915, rsmellus@mcyp.org PHONE: 707-463-4915 EVENT: The Jim Levine Legacy Scholarships THE YOUTH PROJECT IS NOW ACCEPTING SCHOLARSHIP APPLICATIONS FROM 2019 GRADUATING SENIORS OF MENDOCINO COUNTY. The Mendocino County “Youth Project” through its private non-profit arm Mendocino Family and Youth Services, is pleased to announce that the 2019 Jim Levine Legacy Scholarship Award program is accepting applications from graduating seniors throughout Mendocino County. Six scholarships are awarded in recognition of a student’s personal journey in overcoming significant barriers or obstacles that impacted their education at some point, and may have curtailed their plans to further academic or training goals after high school graduation. Students interested in learning more about the Jim Levine Legacy Scholarship can obtain an application packet from: 1) their high school counseling departments; 2) by calling MFYS/MCYP at 707-463-4915; or 3) by going online at mcyp.org. The application deadline is May 3, 2019. Individuals and organizations wishing to make a tax deductible contribution to the Jim Levine Legacy Scholarship Fund may send a donation to: Mendocino Family and Youth Services (MFYS), 776 S. State Street, Suite 107, Ukiah, CA, 95842. Willits Center for the Arts is opening a new sculpture garden. We are looking for sculptors who wish to show their art for 3 months at a time. Send photos of work to gtm1950@gmail.com. December – Small Works $10 fee for the first piece and $5 for each additional entry. Multiple pieces of jewelry may be displayed on a board or frame that roughly measures 16″ x 24.” If the display is larger it will be charged as additional work. Delivery date deadline: TUESDAY NOVEMBER 27 This show will be hung a week earlier than other ACU shows so it will be up and open to visitors on December 1st for the annual Holiday Open House and Craft Sale. January – Deep Winter January is our coldest, wettest season. Trees are dormant, nights are long, rivers rise and residents hunker down close to the fire. How do you relate to this chilly, dark season? Do you (or your subject) celebrate it or do you put your energy into hoping for warmer weather? Open to all Mendocino and Lake County residents, $25 fee for the first entry, $10 for each subsequent entry, with checks made out to Art Center Ukiah. Completed entry forms and all ready-to-hang work must be delivered to the Corner Gallery (201 S State St in Ukiah) no later than noon on Wednesday, January 2, 2019. Artists are encouraged to email photos of their submissions to acugallery@att.net by the middle of December for possible inclusion in the publicity for the show. A refund check will be mailed to the artist for any work not accepted in the show. The First Friday show opening is January 4 from 5-8pm. February – Bejeweled This show will feature jewelry of all kinds for Valentine’s Day. We are looking for pins, necklaces, earrings and bracelets in metal, plastic, fiber, clay, paper, stones or whatever you want to combine into an exquisite object of beauty. We also hope to see lavish wall art, either embellished or representing subjects that are bejeweled. This show will be a flight of fancy and a feast for the eyes. Open to all Mendocino and Lake County residents. For jewelry, pieces must be displayed on a board or frame that is in the 16″ x 24″ size range, ready for hanging. Larger displays will be charged as multiple entries. Artists can supply their own display, or contact the gallery to borrow a framed piece of foam core. There is also the possibility of reserving a shelf in our jewelry case (gallery phone 462-1400). $25 fee for the first entry, $10 for each subsequent entry, with checks made out to Art Center Ukiah. Completed entry forms and all ready-to-hang work must be delivered to the Corner Gallery (201 S State St in Ukiah) no later than 5:00pm on Tuesday, January 29, 2019. Late entries will not be accepted. Artists are encouraged to email photos of their submissions to acugallery@att.net by the middle of January for possible inclusion in the publicity for the show. A refund check will be mailed to the artist for any work not accepted in the show. The First Friday show opening is February 1 from 5-8pm. March – Go Figure If you are a figurative artist and would like to participate in the Quick Draw demonstration, please email Jacquie at jlolich@pacific.net by the middle of February. Participation in this event will be by invitation only. Live models will be drawn by the selected artists, while gallery visitors look on and admire the process. The First Friday live event is March 1 from 5-8pm. April – Gaia The Greek goddess Gaia is the ancestral mother of all life; the primal Mother Earth goddess. And the first Earth Day, which was held on April 22, 1970, activated 20 million Americans and is widely credited with launching the modern environmental movement. Where do these two concepts intersect in your mind? Representational or abstract, we are hoping to see your inspirations in all media. Open to all Mendocino and Lake County residents, $25 fee for the first entry, $10 for each subsequent entry, with checks made out to Art Center Ukiah. Completed entry forms and all ready-to-hang work must be delivered to the Corner Gallery (201 S State St in Ukiah) no later than 5:00pm on Tuesday, April 2, 2019. Late entries will not be accepted. Artists are encouraged to email photos of their submissions to acugallery@att.net by the middle of March for possible inclusion in the publicity for the show. A refund check will be mailed to the artist for any work not accepted in the show. The First Friday show opening is April 5 from 5-8pm. May – 10th anniversary of our Student Photo show This one speaks for itself and will be curated by high school photography instructors. It is not open to the public. 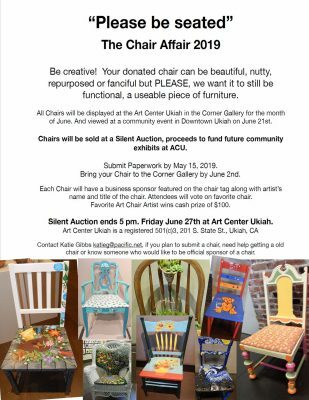 June – Please Be Seated Once again Art Center Ukiah will bring you our almost annual Chair Affair. You are invited to embellish and donate a spectacular chair for this important fundraiser and compete for the $100 Viewer’s Choice cash award. All proceeds from the silent auction will help us keep our doors open. Your donated chair can be as beautiful, nutty, repurposed or fanciful as you like, but PLEASE, we want it to still be functional as a useable piece of furniture when you are done doing your magic with it. We are also looking for two-dimensional “chairy” art for our walls. Indoor chairs, outdoor chairs, formal chairs and funky chairs… it’s up to you to delight us with your interpretation of the theme. Open to all Mendocino and Lake County residents. No entry fee for donated art chairs. $25 fee for the first wall art entry, $10 for each subsequent entry, with checks made out to Art Center Ukiah. Completed entry forms, all chairs and all ready-to-hang work must be delivered to the Corner Gallery (201 S State St in Ukiah) no later than 5:00pm on Tuesday, June 4, 2019. Late entries will not be accepted. 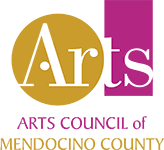 Artists are encouraged to email photos of their submissions to acugallery@att.net by the middle of May for possible inclusion in the publicity for the show. A refund check will be mailed to the artist for any work not accepted in the show. The First Friday show opening is June 7 from 5-8pm. 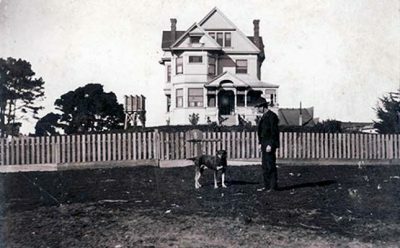 The Fort Bragg-Mendocino Coast Historical Society is seeking donations of local history related artwork to be prizes for a fundraiser to be held in 2019. Please contact Bill Mulvihill, bill@artsmendocino.org for more information. The FB-MCHS is also looking for more docents to great Guest House Museum visitors. Please contact David Maki, dmaki@mcn.org for more information. Approximate time commitment: 3-5 hours per week. (approximately 1 afternoon per week) Duties: Assist Executive Director with programs and office administrative assistance as needed in the Ukiah office. For a list of programs & mission statement, please see: www.ArtsMendocino.org. Sample tasks might include: Filing Data Entry Errands Research Gallery/event programming Member Services REQUIREMENTS: Professional, motivated attitude Good communications skills both written and spoken Basic knowledge of office programs (Word, Excel, Powerpoint) Email address Having your own laptop is a plus. BENEFITS: Introduction to arts administration Work Experience & expanded skill set Areas of professional growth might include: Grant Management Program Assistance Publicity / Press Relations Gallery / Event Management Letter of Reference / Recommendation provided upon successful completion of internship program period. To apply: Please send a letter of interest to: director@artsmendocino.org stating your career goals and work experience, a list of your personal and professional strengths and skills, and a list of the skills you would like to develop. Please include a resume and the names of two individuals who would be willing to serve as references. Please indicate the times/days of the week you are available. Volunteering is a wonderful way to become part of the creative fabric of our community. Many of our member organizations are looking for volunteers to help support their programs, as well as the Arts Council itself. All volunteer opportunities can be found in the Opportunities section of this site.